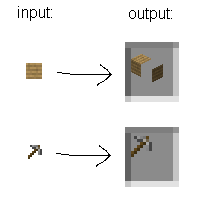 i have been playing around with my 8x8 texturepack and used the unstitcher to make it compatible to the new 1.5 snapshots, but all the blocks and items that has a texture lower than the default resolution gets too small in the game and only fills the upper left part of the item-slot. this did not happen before the 1.5 snapshots. MC-8247 Textures with resolutions lower than 16 pixels don't get rendered properly. It only appears on the lower left corner of a block. Same thing with all items.